Advanced Tactics, founded in 2007, designs unique vehicles mostly for military use. The firm began work on the Black Knight Transformer in 2010 and, through a series of prototypes, arrived at the full-size, gas-powered Transformer model last year. The vehicle, it’s hoped, will one day swoop in and out of combat situations, autonomously carting in supplies and pulling out wounded troops without risking additional lives. This might include flying to a safe landing spot and driving into more dangerous areas. Or when driving isn’t possible—picking up and flying to better ground. The firm road tested the prototype in December in Southern California. The vehicle, bigger than a Ford F-350 truck and with more interior cargo space, tops out at 70 miles an hour on the road. Its large truck tires and shocks can handle off-road situations. But sometimes wheeled transportation alone doesn’t cut it. The six rotors lining Transformer’s sides are powered by combustion engines to lift it off the ground. For the first flight trials in March, the vehicle autonomously hovered ten feet above the ground and was tethered for emergency shutdown in case anything went wrong. But Advanced Tactics says it can fly to altitudes of thousands of feet. There’s no video of the test, but to get an idea of what it might have looked like, check out this video of one of the firm’s smaller prototypes. We might note this is a flying truck (or roadable aircraft) and leave it at that. But the Transformer wouldn’t be possible without a few exponential technologies we’ve seen implemented at smaller scales largely for and by enthusiasts. The aircraft uses variable thrust, more like a model quadcopter than a helicopter. To rise or descend, the vehicle supplies constant power to all rotors equally. To turn right, the vehicle supplies more power to the left rotors than the right, and vice versa to go left. Due to this simple configuration, the Transformer has no need for control surfaces (like, flaps on an airplane wing) or directional rotors (like on a helicopter). This wouldn’t be possible without smart software and sensors. 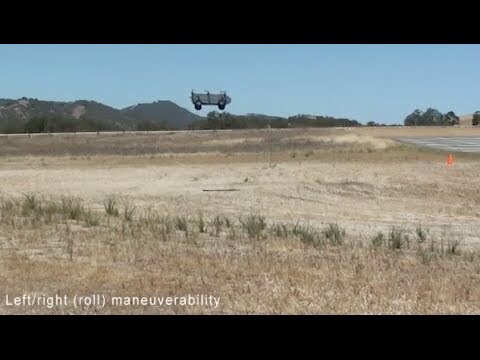 Also, the entire vehicle can fly autonomously. A network of algorithms, sensors, and flight hardware form an AI pilot of sorts. Similar technology autonomously stabilizes amateur drones, leaving the simplest controls to the person flying them. Finally, the Transformer is modular. Modularity allows for easy repair and multi-functionality without replacing the entire machine. Modularity is catching on in other areas too–Google’s Project Ara, for example, aims to make modular smartphones. Malfunctioning rotors can be swapped out by a team of two in the field. And the heavy automobile section can removed to increase payload capacity—it can even be replaced with a boat or amphibious hull for wetter terrain. Whether or not modularity makes sense in smartphones, we can see how it might be useful in military vehicles where one vehicle replacing three can reduce fleet size. And for urgent repairs in remote areas—the simpler and faster, the better. Will such aircraft make their way from the military to civilian life anytime soon? First, the Transformer hasn’t made it into military use yet. Even if it isn’t intended for a full combat zone, the prototype has the look of a flimsy toaster—an easy target for anyone aiming to blow it out of the sky. Advanced Tactics says the final version will, of course, be more aerodynamic. And from the looks of the concept sketches, it’ll be armored too. The final version will be able to tote 1,000 pounds of gear or five passengers almost 300 miles at 150 miles an hour in the air or 70 miles an hour on the ground. A full demonstration of the technology is expected later this year. Examples include the Pal-V roadable gyroplane, and the perennially delayed Terrafugia Transition, a small aircraft whose wings fold in for the road and garage. Both require take-off from an airfield—neither is what you imagine in a flying car. It’s Terrafugia’s next concept (nowhere near availability) that will make Jetsons fans take note. The TF-X (below) would be autonomous or, if you prefer, would delegate only basic functionality to pilots, making flying more like driving. The aircraft would take off and land vertically but would fold in the rotors in-flight for faster, more plane-like flying. But until we move past propellers and combustion engines in personal aircraft, flying cars for the masses seem unlikely, even if we do have the capability. Levitating rush hour into the sky (literally) sounds like a terrible idea, but a few flying trucks in and around the battlefield and roadable craft for the occasional millionaire? Sure.